Order processing lies at the heart of an ecommerce business. 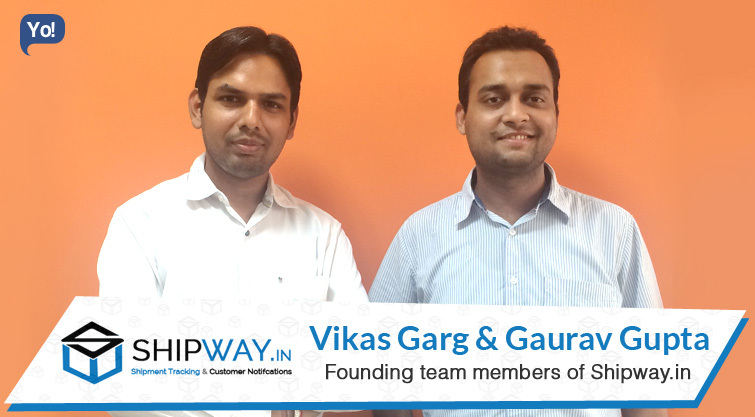 Having worked in the ecommerce for years, Vikas Garg & Gaurav Gupta knew this fact very well. Realizing the scope for improvement in this key ecommerce business element, the duo decided to do something about it. Thus, Shipway was born. Shipway offers ecommerce businesses a tool to automate their order processing, shipment tacking, and notification process to make the whole system more efficient, therefore, more reliable. Since its launch in April 2015, Shipway has partnered with several thousand ecommerce businesses and has plans to provide its service to at least half million ecommerce businesses in next 3 years. Shipway is a SaaS based platform that empowers ecommerce companies in terms of Technology. Shipway provides multicarrier order tracking, notifications (SMS/email) & reviews services. So far, we have been partnered with over 3500 ecommerce businesses and have helped them in catering over 4,00,000 customers. Tracking for all of the 100+ major ecommerce couriers. We also provide SMS/email timely notifications to online store customers. Order Reviews/ Feedbacks, to know more about what customers think about their store. I am into ecommerce industry for past 6 years. While working I felt that order status and notifications are the nerve of an ecommerce business. But I realized, small or big, most ecommerce businesses are not able to handle these key elements efficiently. Additionally, revenue status, profits, order returns, customer queries, etc., are all crucial parameters for an ecommerce business. So, as an attempt to help ecommerce business manage their lifeline better, we started Shipway.in. Keep focused on my product and to reduce manual effort to build world class services. Most challenging part in Shipway.in’s journey was to start with premium clients. Their expectations are many. We covered most of their requirements but all of them are not possible. We realized that presently We do not have so many resources and funds to address all of the requirements of clients. So, We decided to go ahead with common requirements to touch most of the clients, Also make note of pending features. We will start offering pending features one by one with time. Currently, we are bootstrapped. But we are in talks to raise $1 million for technology development and improve support. We are open for any type of discussions and suggestions with our Team. We work like a family with passion and energy. Evernote, Wync music, and Quora. Short meetings with team, Just to set the vision of task and goal. Driving fast and ignoring traffic rules. Be clear about your vision. Focusing on funding instead of improving the quality of product & service. Product support of your product must be premium than developing additional features. It’s a huge market in terms. We are focusing on partnering with half million sellers in next 3 years to use Shipway services worldwide. I would start my career in automobile technology innovations.